Starbucks is a go-to morning routine for most people, and with the recent addition of a Starbucks at Hollywood Studios helps us get a nice kick-start to our mornings! We know that you can get your Starbucks anywhere, but the Trolley Car Café has an amazing atmosphere and amazing offerings that are on the Disney Dining Plan. Trolley Car Café has made its way to #5 on our top snacks at Hollywood Studios! Popcorn – in a R2-D2 popcorn bucket of course! Popcorn is a great quick snack, especially in a souvenir bucket! This R2-D2 popcorn bucket from the Star Wars Weekends is a great addition to any collection of popcorn buckets! One of the hidden gems at Disney’s Hollywood Studios is the Writer’s Stop. This little coffee shop features a large selection of snacks, however the pecan caramel roll is a big hit! 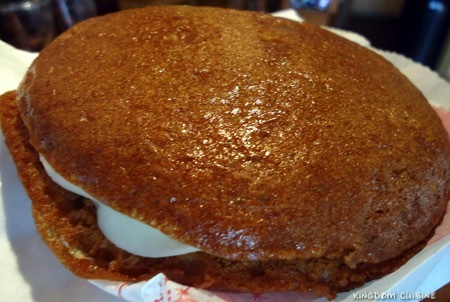 This delicious treat is a great breakfast alternative for those looking to eat in the parks. Pair it with a nice coffee, espresso or cappuccino and you are sure to have a great day! Another gem from the Writer’s Stop is this carrot cake cookie! This carrot cake cookie has two cookies and a delicious cream cheese filling between making a nice sandwich style cookie. Starring Rolls Café features three delicious cupcakes. The butterfinger cupcake, chocolate peanut butter cupcake, and red velvet cheesecake cupcake are tied at our #1 spot. We highly suggest that you get all 3 and share! That carrot cake cookie looks delicious! It’s so interesting how Disneyland and WDW have completely different things — the only item we have at Disneyland (haha “we” like it’s mine!) is the R2-D2 bucket (and Starbucks, but that’s like saying both Parks have restrooms!) This is a great list!